We tore strips of colored tissue paper to look like mountain ranges and glued them down using watered down glue hopefully creating a 'snowy mountain' scene. To make it a bit more interesting I bought a horse stamper and we stamped out little horse shapes in different colors including silver and positioned them on the picture to look like a stampede of brumbies. 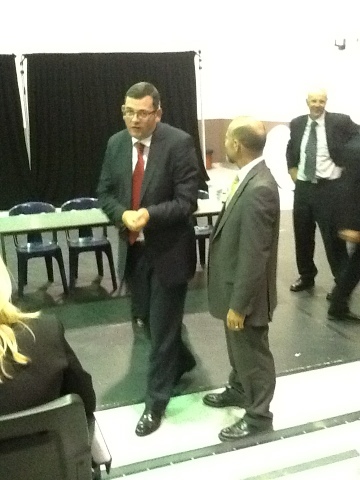 Daniel Andrews and James Merlino (Opposition Leader and Education spokesperson) visited Ballarat today and spent an hour and a half listening to principals and staff from Ballarat and surrounds discuss pressing issues in schools and getting some suggestions about future policy directions. Daniel conceded that his party wasn't perfect in government but he is asking communities to provide ideas and issues for the alternative government to focus on in opposition. Daniel wanted to know what the 'story of sate education' is in 2013? He believes that we have a responsibility to tell that story given the current state of a struggling government education system. issues raised included; funding cuts, contract staff, The Gonski review, the downgrading of the state system, lack of resources, cut backs to regional support, rural education issues, Ultranet, openness and transparency and the positive stories to come out of state education.Daniel said that this year was the year that the Opposition would be developing policies for the 2014 election and that he would be interested in coming back again to report on their policy development in education in 2014. 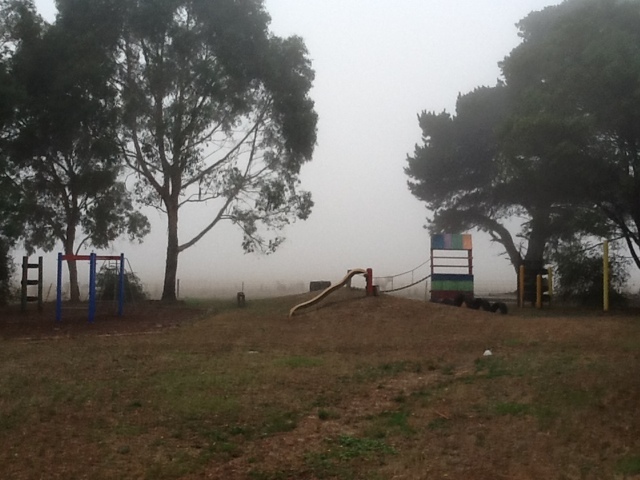 After our tropical weather of late some cool weather swept in creating a spooky mist around the school. 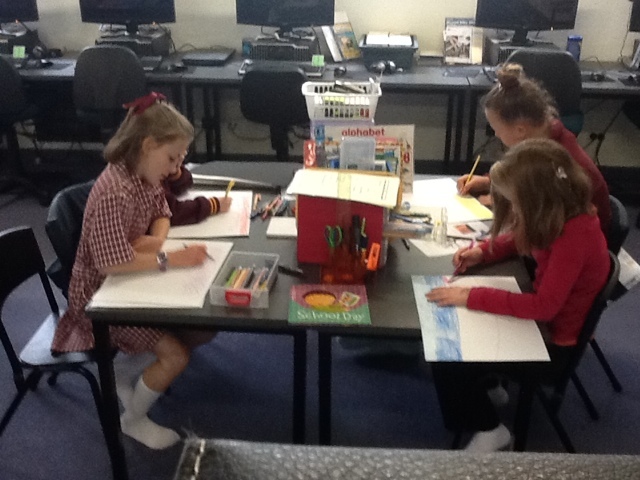 Children creating perspective drawings in the hope that they'll draw interesting backgrounds to their pictures. Here's hoping. 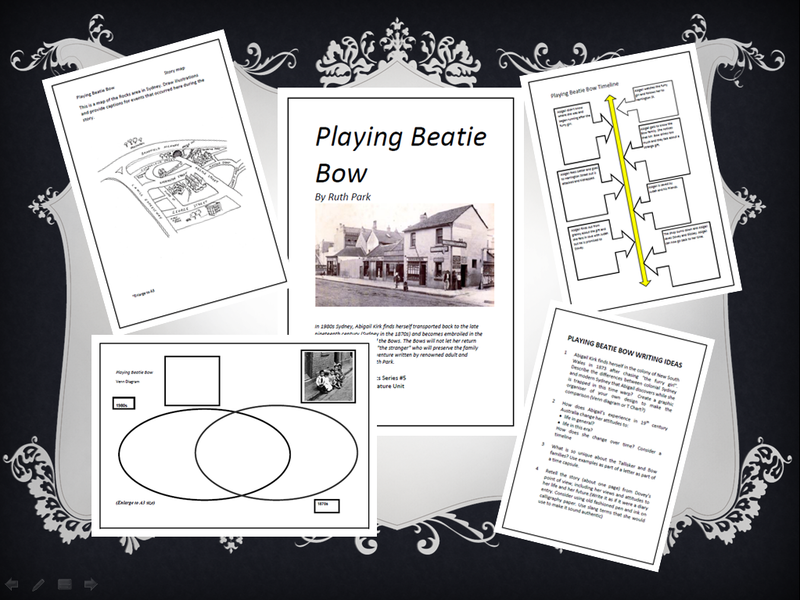 Playing Beatie Bow was a literature unit I used 2 years ago with a History unit on colonial Australia. 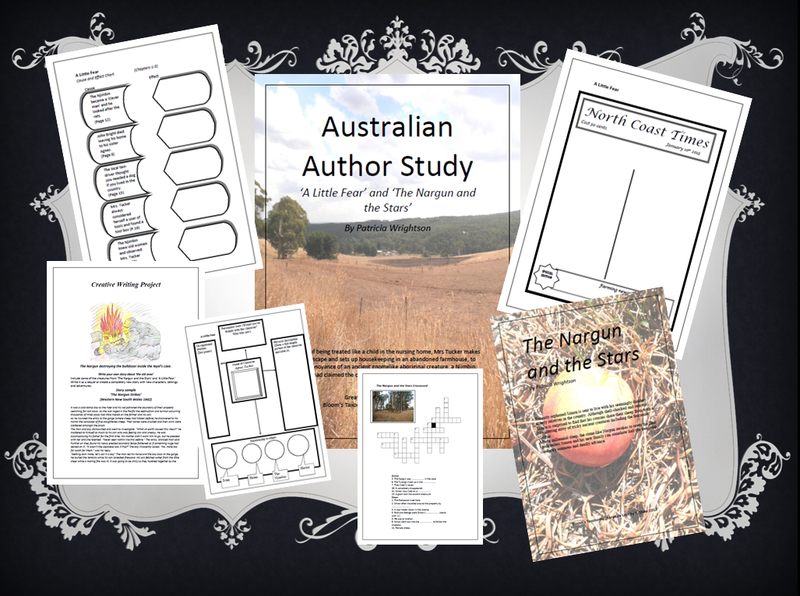 This is the fifth in a series of literature units of classic Australian children's fiction. You will find this unit on Teacher Pay Teachers for FREE! Click HERE to download this FREE..........yes, free literature unit for Playing Beatie Bow. 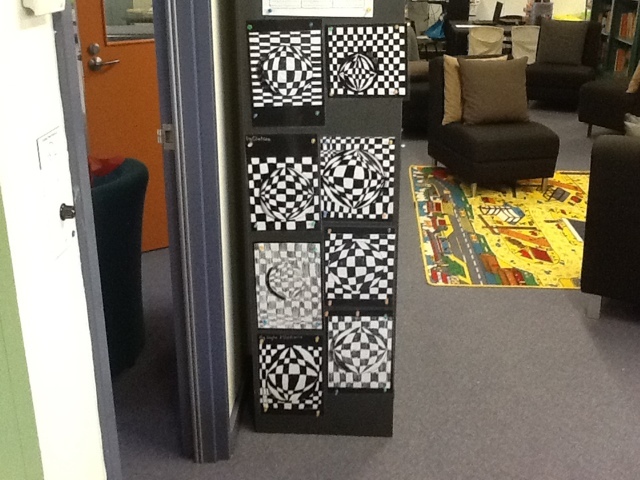 I call these 3D chequer board sphere pictures. I know, it's a long title but it sort of explains what it's all about. Another idea I got from Pinterest. There are a lot of great art blogs and Pinterest boards out there with fantastic ideas! 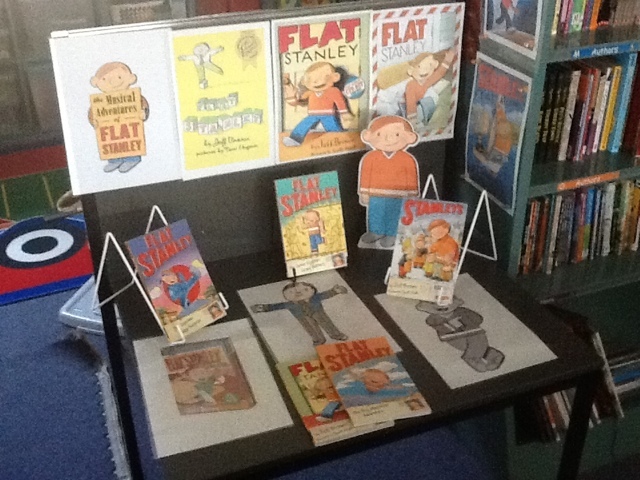 Check out Shanna Piat's Pinterest boards, I've got a lot of great ideas from her pins. 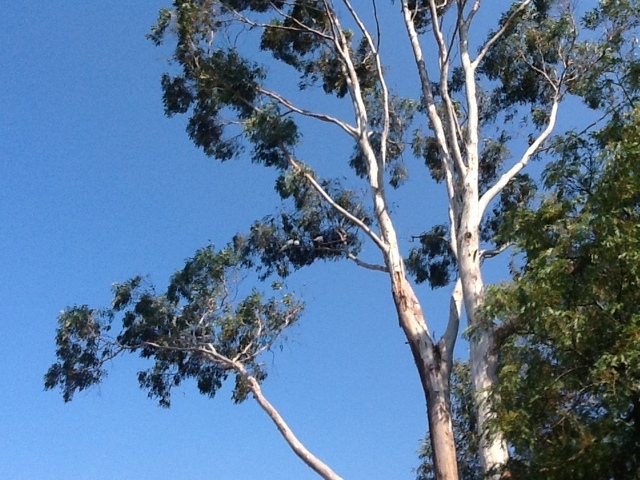 Some very noisy cockatoos 'serenaded' me from one of our gum trees today when I was up at school to clean. 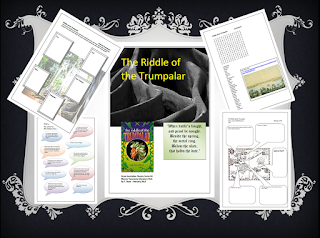 Click HERE to go to a Bloom's Taxonomy literature unit for The Riddle of the Trumpalar.This is the fourth unit in a series of units I am placing on Teachers Pay Teachers. I taught this unit last year. 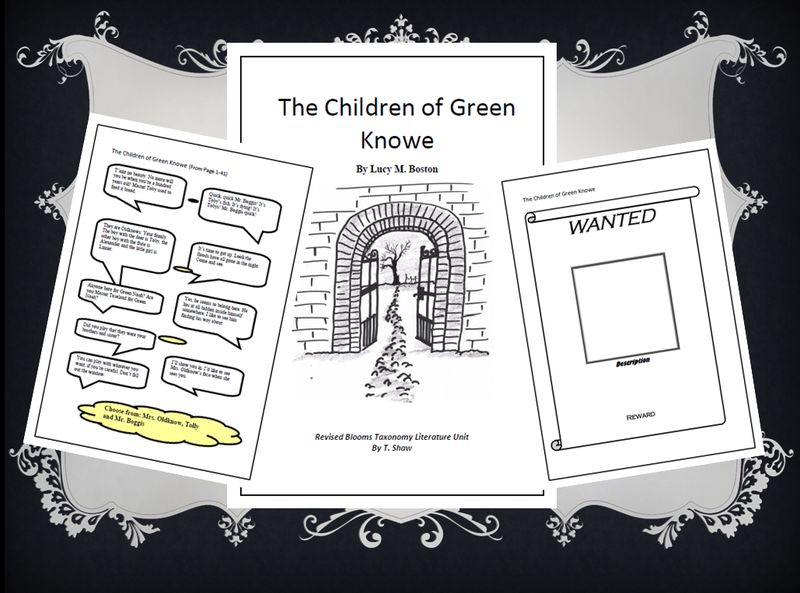 The children loved the story and it supported a history unit I was doing on the white colonisation of Australia. There is a sequel but I couldn't find it. This is an unusual work as it was written by 3 authors. The author's name on the book is a combination of the 3 names. 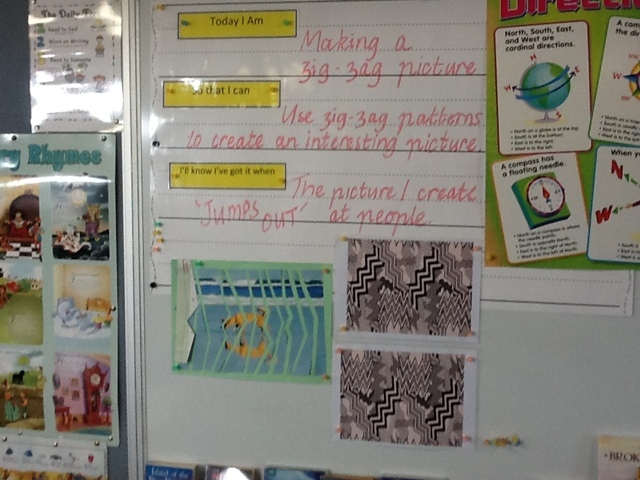 Our Maths project to start off the term was on location and direction. 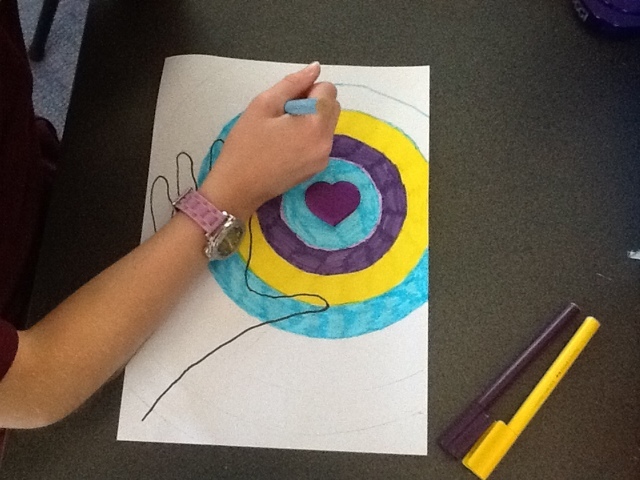 To complete the unit grade 4-6 students were asked to create a map of the school. They took photos outside using their iPads to add to their map and also used a variety of mapping apps to locate satellite images of our school. I wanted their projects to be to scale as best they could but to also use a key and to determine where north was for a compass. 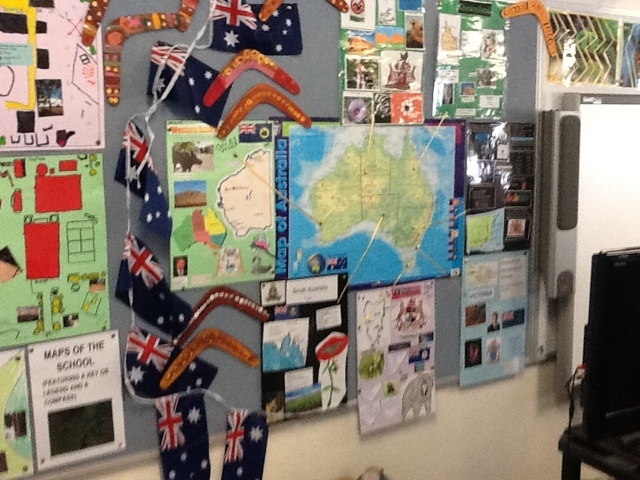 We just finished projects on Australia. 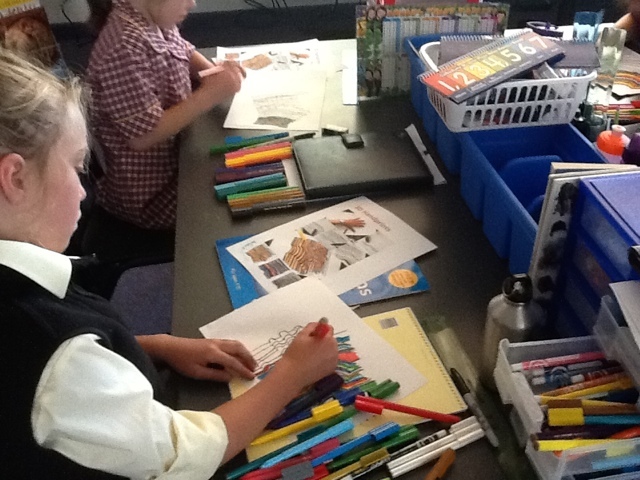 Each child was given a state to research and a set of questions to answer. 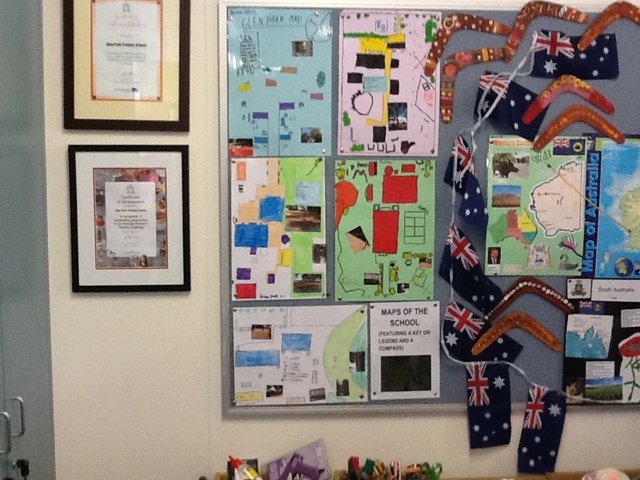 When they finished we arranged the states around a map of Australia and they were asked to create their own puzzle worksheet about their state which the class could answer using the information of the project. They loved setting really hard questions. 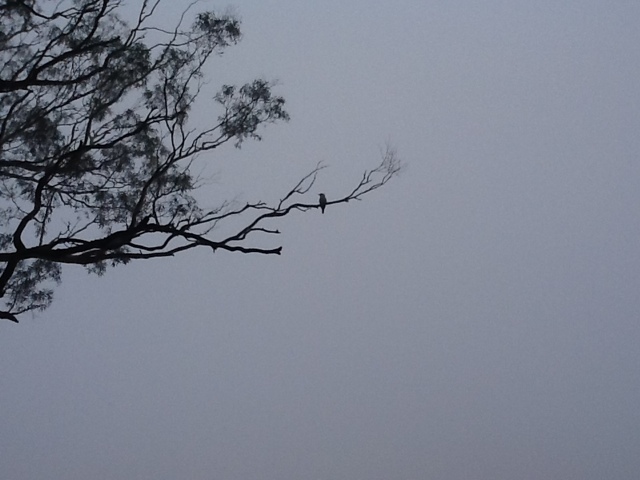 Nice and peaceful, if dry out here with the kids inside playing Minecraft on their iPads. 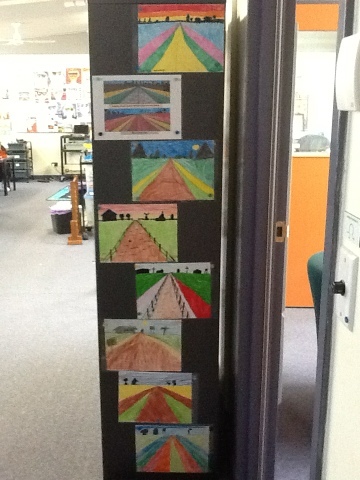 We used water colour to paint the bush and then followed step by step instructions from The Dragon Art web site. These three unit plans have just been put on Teachers Pay Teachers. (Just click on the title of each below and it will take you to the product) Ash Road was a novel we studied last summer (2012) and is a free download. 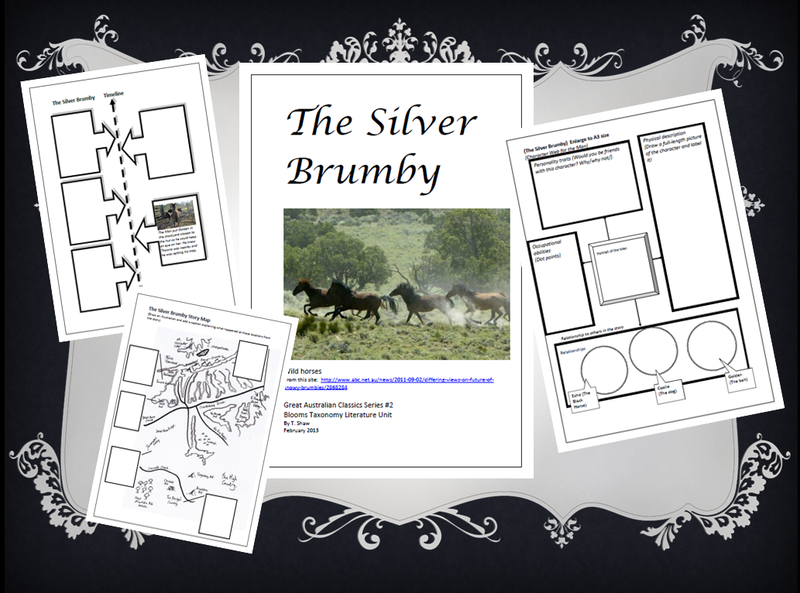 The Silver Brumby was developed this year for a 'horse happy' student in my class but will hopefully be enjoyed by others. 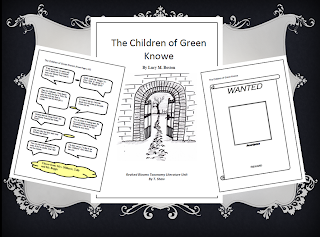 A Blooms Literature unit plan for the first book in Lucy Boston's Children of Green Knowe series. 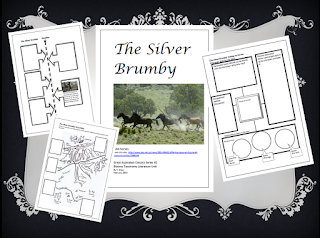 This Blooms Taxonomy literature plan for the Silver Brumby is the second in a series of classic Australian children's book unit plans on Teachers Pay Teachers.Others in this series will include-Storm Boy, Playing Beattie Bow, The Riddle of the Trumpalar, The Nargun and the Stars and others. Some will be free and others will cost a modest $3.00. The aim is to re-kindle interest in fantastic internationally award winning and popular Australian literature from authors such as Joan Phippson, Colin Thiele, Ivan Southall, Ruth Park and more. 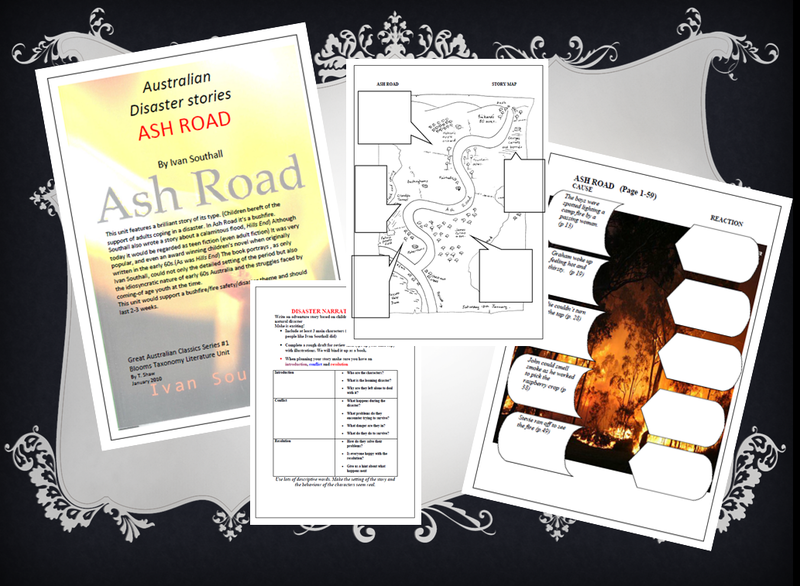 Ash Road by Ivan Southall is the first in a series of Blooms Taxonomy literature units based on classic Australian children's literature from the 60s to 80s. 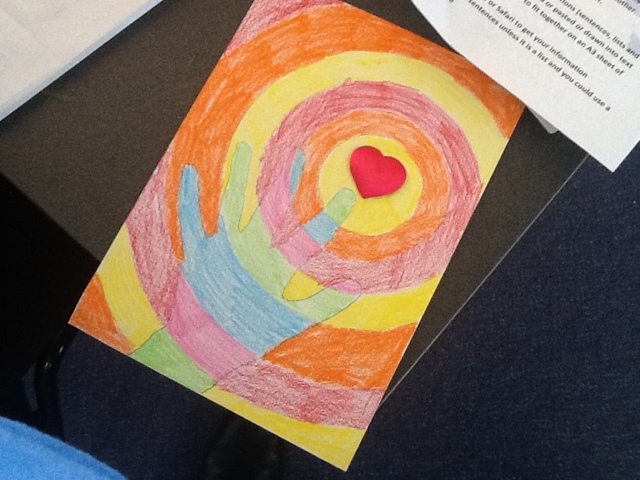 Cool hands - warm heart picture for Valentine's Day. Some got the idea of warm and cool colors a bit mixed up but they still did a good job. Their mums should be pleased when they get these on Thursday. Today we received information about the new Regional structure which now stretches from Footscray to the SA border including Geelong. The new region is huge. you don't appreciate how big it is until you see it outlined on a map of Victoria. There are over 1500 principal class staff in our new region.The meeting was full and it was good to catch up with a few people I haven't seen for a while. Malcolm talked about flexibility being increased and the fact that we are now a rural-metro region.Malcolm believes that 4 regions will enable greater synergy.We still have to address the same level of accountability as before but with alot more autonomy. The new role of the region is a partnership role with schools to help plan to meet the needs of our communities.Malcolm believes the context of our new leadership has changed but has not been completely determined yet. 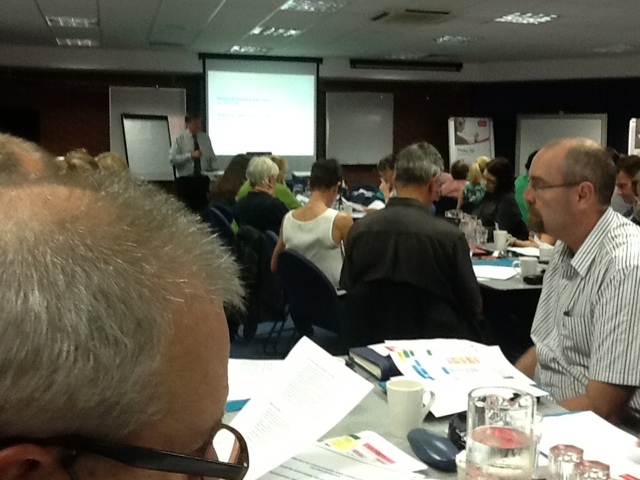 The structure is still being put in place.The role of regions is now to support schools to self-manage. New networks will not be determined by region and need to be driven by network principals. Although self-driven they will be supported.There is still more work to be done regarding the 'compact' and principal performance and selection. The Secretary wants to see sharing of best practice and the effective 'marketing' of our schools.Interestingly there was an emphasis on principals to see ourselves as 'public servants'; and that 'ownliness' is essential-How do we manage things that go wrong and how do we learn from it. Malcolm intends to create a principal reference group so hopefully principals can provide direct feedback to him and central office about how the new reforms are being rolled out and how effective they are.The new SARPP role will be a guide and advisory role. 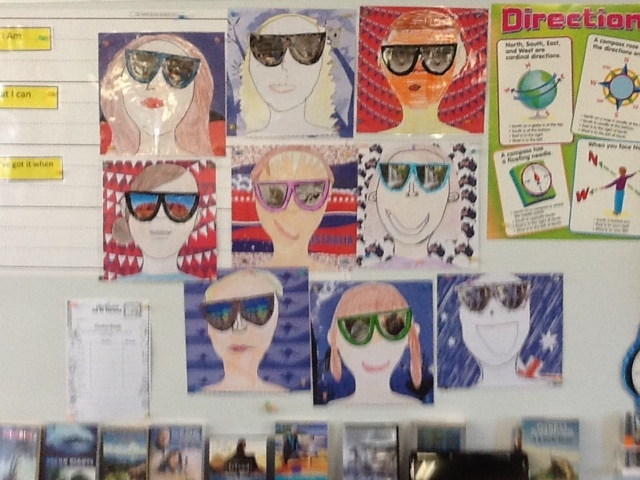 Malcolm suggests that we develop our own 'story' -our theory of action , values,beliefs and vision. He challenged us to develop the story of our own community. 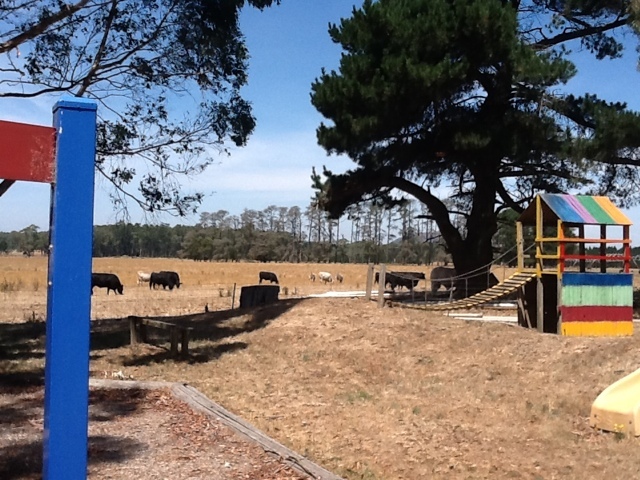 (We have only recently developed new, simplified school values at Glen Park. ) Malcolm emphasised that as good leaders we need to practice integrity, communicate and provide feedback. Just a note about this blog.As with the blog, I started on tumblr, this blog is not an official school blog ( We have a school website. 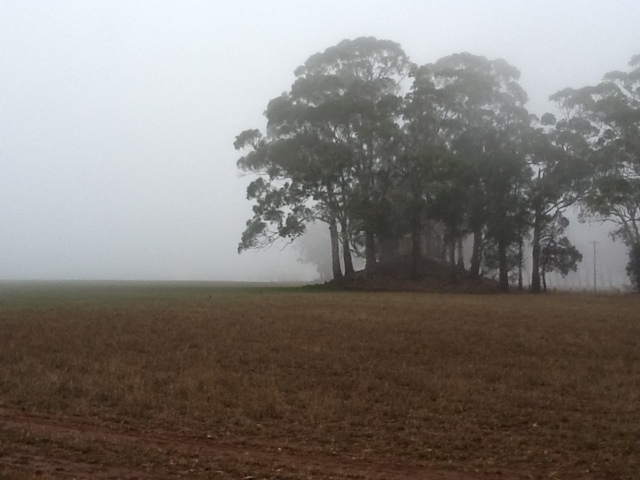 A link is on this site) It is my blog about my experiences as a teaching principal in a one-teacher rural school and about state education issues. 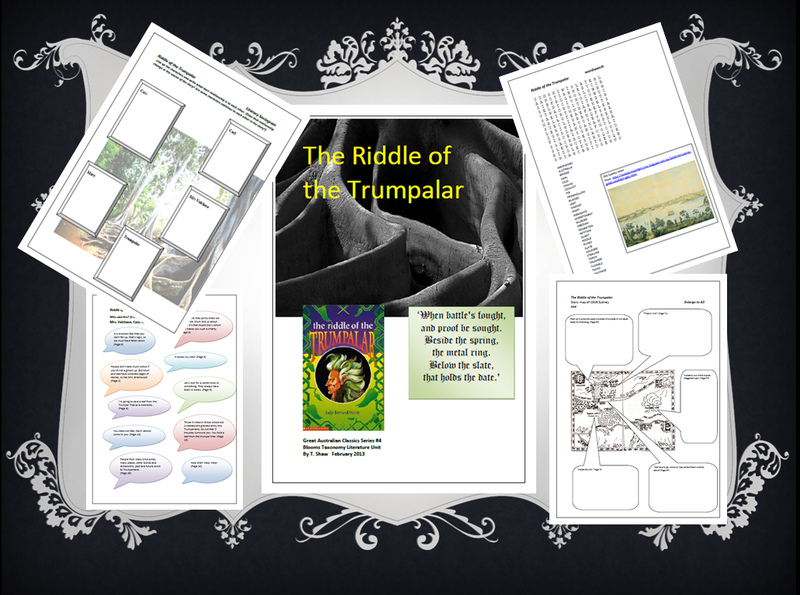 it is also a site where I can post unit plans for TPT ( Teachers Pay Teachers) and teaching ideas that can be found on my education related Pinterest boards. 3D hands. I got this idea off Pinterest. 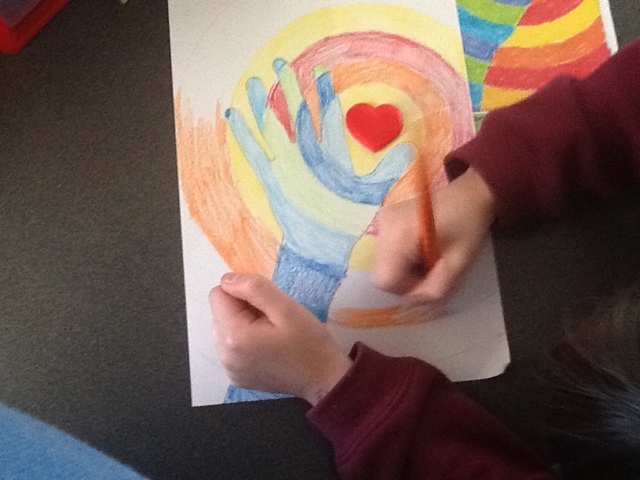 ( If you haven't been on there before, have a look there are some great education ideas on there) All you do is draw around your hand and then draw across it sing straight lines until you get to the hand itself and then you do a curved line. 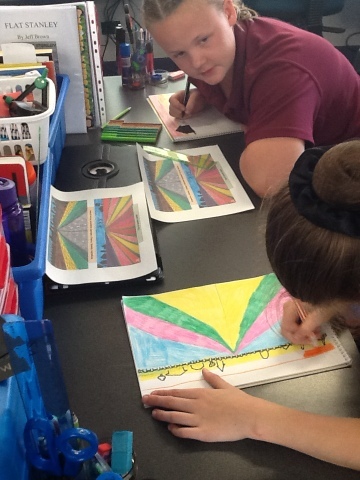 We used black texts and then followed the lines with crayons ( 3 contrasting colors) It worked quite well. Simply cut up a calendar. 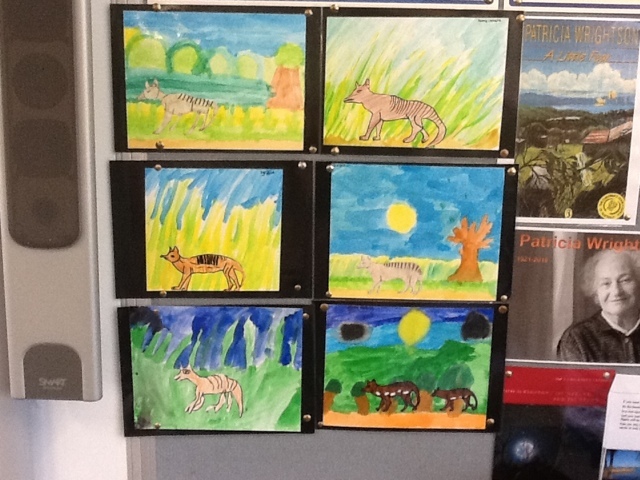 Give a child a picture each ( I chose Australian native animals) and have the children rule up zig zag lines on the back and cut out the strips reassembling it with a gap between the zig zags onto colored card. I worked wel. 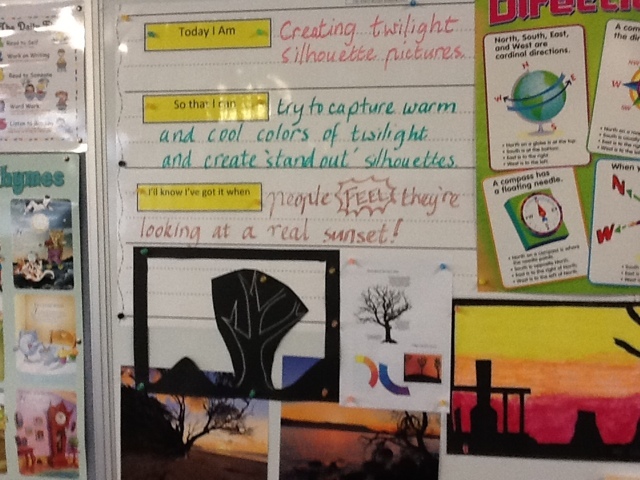 Learning intentions for silhouette pictures. 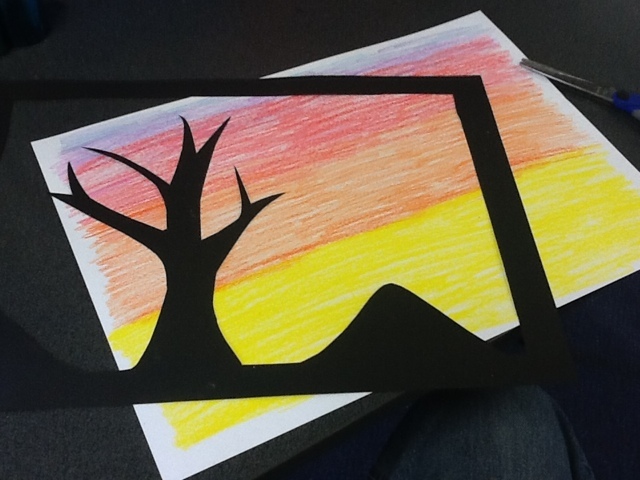 Children used paint, crayons and pastels to create a sunset on white A3 cover paper. 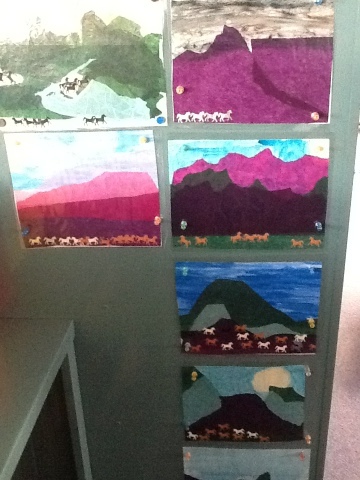 The children then ruled up a frame on black cover paper including a tree, hills, boats, lighthouse etc. 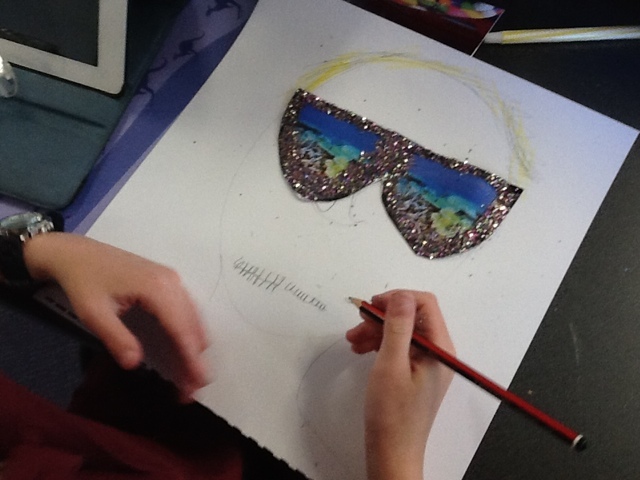 and glued it over the top of heir sunset. It was then laminated. 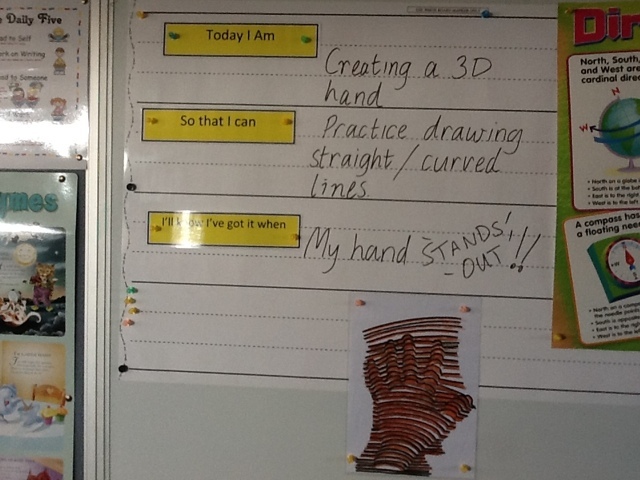 Children from foundation to 6 (some needed help with cutting out) enjoyed the lesson and completed it in 90 minutes.